Deadlocked 1 by A.R. Wise is a self-contained story in a larger series chronicling the zombie apocalypse from the point of view of the survivors. At work when society begins to collapse, David needs to fight the hoards to get home to his family and secure their protection. At a brisk 54 pages, the plot develops quickly with non-stop action but AR Wise still manages to flesh out the characters in a believable way. 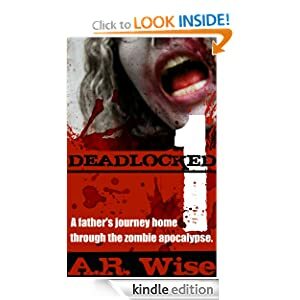 Get Deadlocked free at Amazon. If you enjoy the story, get the Deadlocked – Complete First Series, Books 1 – 4 for $6.99. Once a week, we present one short zombie-themed story or novella that is fun, fast, and best of all, free. It’s the end of the world and all Kent wants is that bottle of American Honey on the bar of the Drop Dead Tavern. Instead he meets a kid named Billy who comes with a lot of baggage. Drop Dead Tavern is a quick read at 3500 words (about 14 pages) and features a solid story and a strong protagonist. 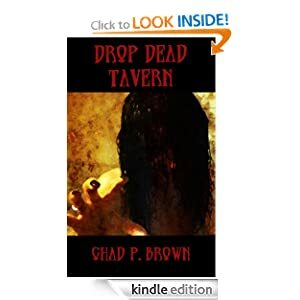 You can find Drop Dead Tavern at Amazon. If you enjoy the story, Chad Brown features Kent in the full length novel, Messiah of the Zombie Apocalypse .